Basketball Pillows are available in 3 various sizes. Lumbar Basketball Pillows Style and Square Pillows. The more affordable pillows are a Polyester Blend and the higher priced pillows are made with a Grade A Cotton. Customize Basketball Pillow just for her. These Basketball Pillows make great Basketball Gift Ideas. Girls will love these Personalized Basketball Room Decorations for Birthday and to celebrate the end of the season. 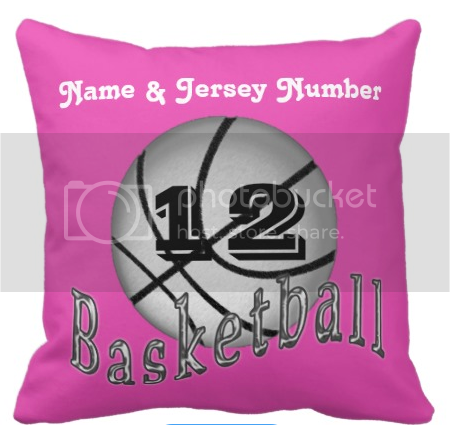 Here is the Back View of this Hot Pink Basketball Pillow for Girls Basketball Decor. Cool Basketball Gift Ideas for Girls. You will be able to see the Front and the Back View once you are on the Zazzle product page. Click on the view image to see. Click the “X” like icon near the upper left side from the Basketball Pillows to see a really large close up view. It will have a temporary light Zazzle image over that image to keep people from using that image. 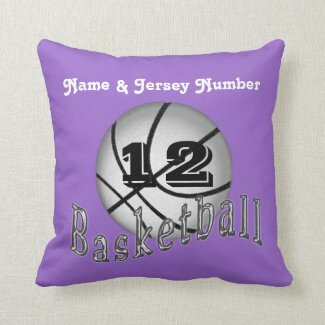 Type in YOUR Basketball NUMBER or MONOGRAM on many of the designs. 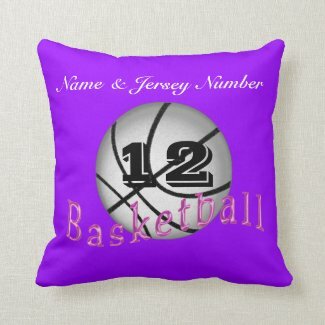 Basketball Pillows for Girls make great Basketball Room Decorations and they are even customizable with her NAME and Jersey NUMBER. They come in a variety of different colors Pink, Purple, Radiant Orchid or ANY COLOR or TEXT you wish. The solid background colors can be changed by Clicking on the Blue “Customize it” Button under the Product Image on the Zazzle Product Page. Now look to your right underneath the “Customize it” area and Click the “Edit” Drop Down Box and at the very bottom, select “Background” and then select a color box. Click the “Advance” word if you wish to tweak the color or add your own Color Code. In 1976, WIAA,( Wisconsin Interscholastic Athletic Association) sponsored a girls basketball tournament. Class A Madison West, Class B Lancaster and Class C Marshall were the first Championship Teams. Neenah, Bloomington and Clinton were the runners up. I hope you will visit my Zazzle Shop and enjoy the huge variety of Personalization Gifts. Cute Animals, Customizable Gifts, Watches and sooooo much more. Thank you for taking the time to visit here today, I really appreciate it.